Welcome the colder months with your very own red blend made at Durbanville Hills Wines on Thursday evening, 31 May. Under the guidance of red-wine maker, Wilhelm Coetzee, you can discover first-hand how to create your own Bordeaux- and Cape-style blends. 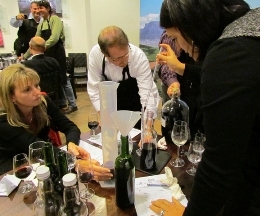 Wilhelm will assist teams of four in creating their own unique wine which will then be bottled, sealed under cork and labelled. After the blending experience guests can indulge in a sumptuous lamb and tomato bredie served with mini-dumplings and white rice. The meal also includes a chef�s salad, bread rolls and butter. Round the evening off with coffee or tea and biscotti. There are also fantastic prizes up for grabs for the best blends. Durbanville Hills� wines will be on sale during the evening. 17/09/2012 17:10 - Recycle and Score with Durbanville Hills!